"And he knows that he’s fighting something, he’s fighting something evil." Update: Superhero Julian Roque passed away at 9 p.m. on Saturday, June 2, in the arms of his parents and siblings. Donations made to the family’s GoFundMe account will assist in the medical bills and funeral expenses for Julian. The Joker would only laugh himself back into Arkham Asylum if he met his boyish charm. Julian Roque can beat all three, but his toughest battle may be nearing its end. The six-year-old has a brain tumor known as "diffuse intrinsic pontine glioma,"or DIPG. It’s a cancerous tumor that sits among the nerves in his brain stem. It is inoperable and it is terminal. The survival rate is less than 1 percent for anything longer than eight months after diagnosis. Julian was diagnosed nearly 4 years ago at age 2. "It’s something that’s taking the lives of so many children and we don’t feel there’s enough research, there’s no cure," Julian's father, Rudy Roque of Inglewood, said. 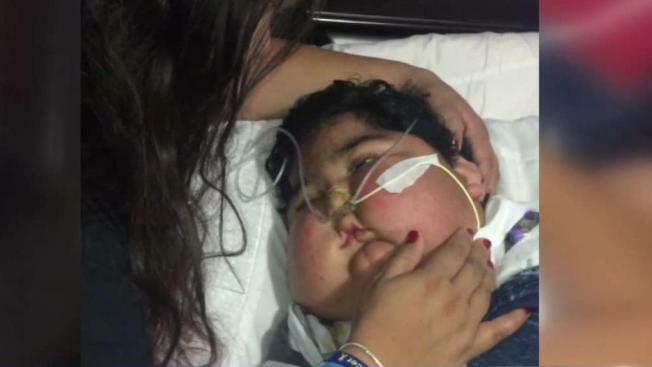 Julian’s family – his dad, his mom, an older brother and sister – haven’t heard his voice in two months. The disease is progressing and over the Memorial Day holiday, it got much worse. "He was having trouble breathing," Rudy said. "We rushed him to Children’s Hospital LA and doctors and nurses swarmed him. They told us we may only have a few hours to say goodbye." That was almost a week ago. And this little superhero – who would show up to his chemo treatments and to his classroom dressed as different Marvel and DC Comics heroes – is still fighting to stay alive. "He’s just embodied what a superhero is. He’s courageous, he’s fearless," his father said. "And he knows that he’s fighting something, he’s fighting something evil." While the family sees their borrowed time with Julian as a blessing, it’s also led to a pile of medical bills for parents that have had to take leaves of absences from their jobs to care for their son. And that doesn’t include an impending expense still to come – planning for Julian’s funeral. "When he decides that he’s ready to go, we’ll honor him when he’s ready,” his dad said, holding back tears and showing what he says is the strength his son has given him. And when that time comes to say goodbye to little Julian, in a sense, his life will continue for a bigger purpose: Julian will donate his evil enemy tumor to research scientists. "To hopefully someday have a cure for this particular cancer," his father said. Over the four years of this ongoing battle, Julian’s had the chance to meet some superheroes with visits from dozens of costumed characters. One in particular, Ricky Mena’s Spiderman as part of the non-profit "Heart of Hero" made a special impression on the young boy – bringing a smile his family hadn’t seen in weeks. In his hospital room at CHLA, Julian is surrounded by the Incredible Hulk, Iron Man, Captain America, Thor, Batman, The Flash; by drawings from his siblings, cousins and friends. And by his family, who watch on in the hopes of seeing him smile or even blink. The medications have disfigured the handsome boy with swelling and weight gain, but has helped to keep the swelling down in his brain. It’s given him more time, and his family a daily blessing until the end. "Every day that we have on this earth with our kids is a blessing,” Julian's father said. The family has set up a GoFundMe account where friends and strangers have become fighters with Julian, offering to help cover some of the expenses – reaching into the hundreds of thousands. If you would like to donate to a GoFundMe account set up to help Julian, you may do so here. Note that GoFundMe deducts 7.9 percent of all funds raised in the form of platform and payment processing charges.